It's amazing how the general public will allow a journalist or activist to teach them about a complicated subject like economics and walk away with the completely wrong idea. Mark-to-market accounting is a perfect example, where firms list the current value of their assets instead of what they originally paid for it. The public thinks it should be stopped because Enron used it to list phony values, but the alternative forces companies to list completely fictional values of assets because the prices have fallen or risen since purchasing. In other words, that 8-track maker isn't the cash cow it once was. Another example is the public's uninformed hatred of speculators - investors who bet on the future value of a resource. The general public has heard that speculators drive up oil prices, and make no contribution to society. But economists insist that speculators keep prices from being volatile and serve a very useful purpose by evening the value of commodities over time. Luckily, we have a natural experiment in place - onion speculations have been banned in America since 1958, so how steady is the price of onions over time? The difference is absolutely striking. 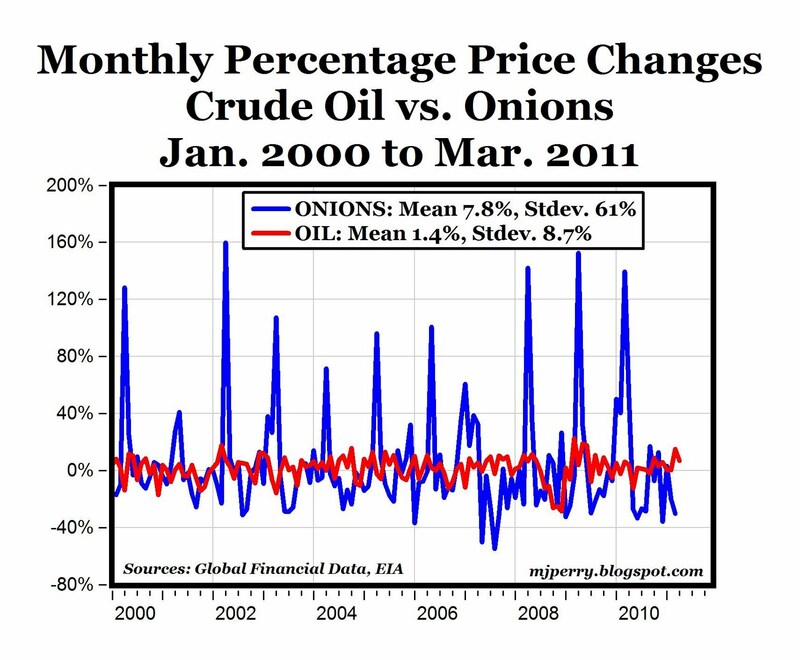 No speculation in the onion market correlates with a volatile price. While this doesn't prove the explanation once and for all, it is a dramatic piece of evidence. Hmm... apples and oranges. You can't compare seasonal vegetable prices to the price of a commodity that can be harvested steadily year round. Looking at the graph closely indicates that the price of onions goes up at the beginning of the year - winter - when supply is naturally low. A better graph would compare the price changes of onions to another vegetable grown in similar climates with similar shelf life and where speculation is not banned. That's not to say you're necessarily wrong - but rather I'm not convinced by this graph. This is a wonderful example of irony since you appear to be both a journalist and activist. The "public discourse" (by which, I suppose, you mean that done by economists during the freefall) on marking to market had nothing to do with the practice itself, it had entirely to do with valuation of risk of derivative instruments based on those values. You've misplaced the argument by three full degrees. The Youngberg article misrepresents seasonality as volatility, which is simply bad journalism. Your conclusion that "it is a dramatic piece of evidence" is based upon absolutely nothing more than visual correlation, even worse journalism. Suggesting that Stossel is an economist is just … laughable. His "article" is a pile of straw arguments and tautologies. It's possible and reasonable to suggest that futures have a net benefit to society and spot trading but your editorial does none of these. I would suggest writing about how delta one instruments provide symmetry between speculation and spot trading because that is what creates stability. What you have provided instead is inaccurate, misleading, and does derivatives a disservice. You can also browse Mark Perry's original post comments, which informs you that seasonality was factored and that gasoline demand is seasonal as well. As for J's other points, I thought Stossel did a good job of summarizing what economists say, it was not my intent to imply he was an economist - this is more sharpshooting than an attempt to provide valid criticism. As a journalist I am entitled to criticize other members of my profession. I have no regret in presenting a correlation as evidence and not "proof." I chose my words carefully for a reason. The rest seemed like an attempt to imply expertise by the use of needless jargon, instead of trying to make any sort of point. Mark-to-market accounting has caused real and verifiable problems, most notably in the mortgage meltdown. If liquidity vanishes from a market (like mortgages in 2007), and the market value of those mortgages goes to near zero, mark-to-market makes the problem instantly worse. The mortgages still involve holding a title to a piece of property along with a monthly payment. But now the mortgage lender must declare that he has practically NOTHING on the books. Fundamental value must be taken into account to avoid these situations, which can turn practically nuclear overnight.